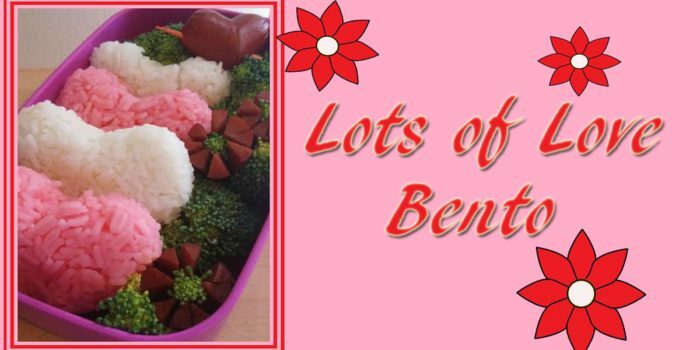 This bento is the perfect thing to show your love this holiday, and what makes it even better…. its SUPER easy! This is a basic layout that you can play with to make it the perfect lunch for you. First thing I do is cook the rice. You want that to be cooled down enough so as not to burn yourself when you need to shape it. While that is cooling lets work on the hot dogs! Fist thing to do is make a diagonal cut near one end, this piece that is removed will be the first part of your heart! Take that piece and use it as a guide to match the diagonal cut on the opposite side of the hot dog. Put those end pieces together, and you have a heart! 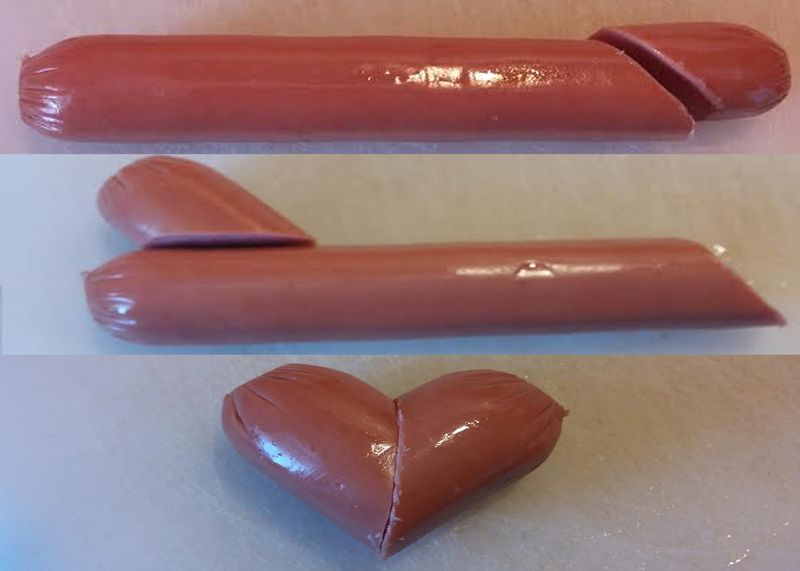 After you cook the hot dog you can make the heart stick together with a tooth pick. Bonus: if you have a piece of raw spaghetti you can use this instead. By the time your loved one goes to eat their lunch it will be soft enough to eat, so no worrying about chocking on anything! Now with the rest of your hot dog we are going to make flowers! To do this you will want to even out the ends, that way the flowers will sit up right in your lunch box. Do not through these cut off pieces away! Any ugly or extra pieces can be tucked under the rice so they can still be eaten, but wont effect the presentation. Once you have the ends cut flat you will want to cut the remaining piece in half, this will give you two flowers once we are finished. 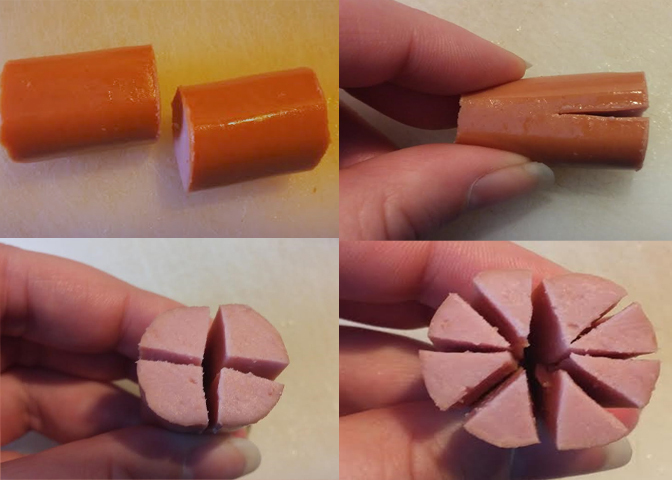 Now make a cut about halfway down the hotdog piece, making it so there are two ends on one side. Try and make all your cuts about the same length into the hotdog piece after this. Next your going to turn the hotdog piece over and make a second cut, now you will have 4 pieces on that side. From here you want to be careful to keep everything even. Cut each piece in half, so you are left with 8 pedals! At this point you want to cook your hot dogs. I chose to make them into Shoyu Dogs, which essentially means that I boil them. If you would rather do something different with them that is fine, but I recommend either frying them in a frying pan or boiling them otherwise the flowers may not open up as they should. 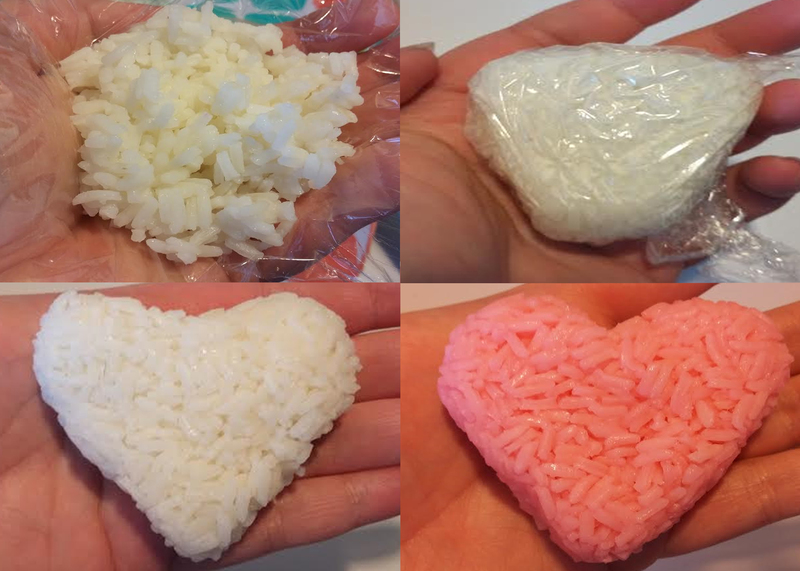 Next its time to shape the rice into hearts. The first time you try this it can seem tricky, but once you get the hang of it you will fly right through the rest. To start you will want to get a piece of saran wrap and cover your hand, this will make it so you can touch the rice without having it stick to you. With either color rice scoop about a palm full into your hand and wrap it with saran wrap so that no rice will fall out while you shape it. I start by making my rice into a rough triangle shape. To do this firmly pack the rice together between cupped hands, but be careful not to squish it into mush. Once you have a basic triangle shape you can start to shape in the indent on the top of the heart, remember to try and keep the edges a bit rounded. After it is all packed together carefully unwrap your heart. It should be sturdy enough to handle, but it will be a bit fragile so don’t just throw it around. Sorry couldn’t help it haha. Now that you have everything prepped, its time to put your bento box together! I started by filling in the edge with broccoli. This way the rice has something to lean on and give it a little support so it wont just crumble. At this point you can also throw any leftover pieces of hot dog into the box, that way it will be covered by the rice. 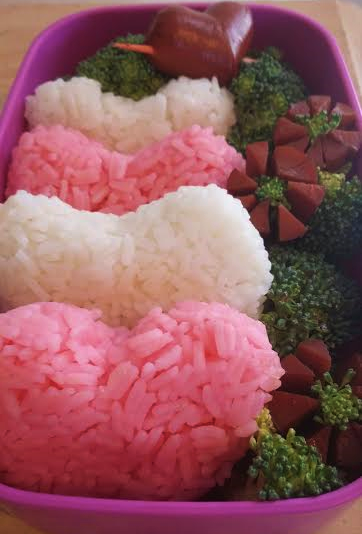 Gently place the rice hearts in the box, leaning back again the vegetables. 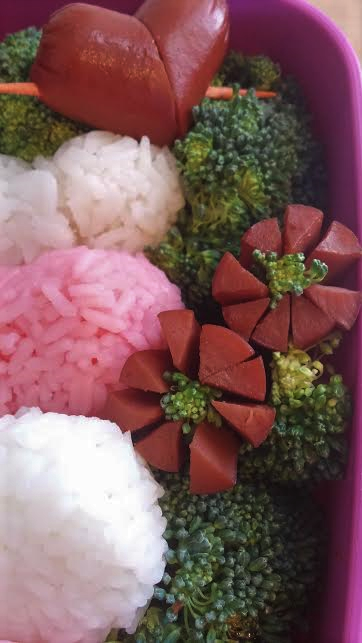 As you lay in the hearts tuck in the vegetables and hot dog flowers around them to give the rice the support it needs to stay together. 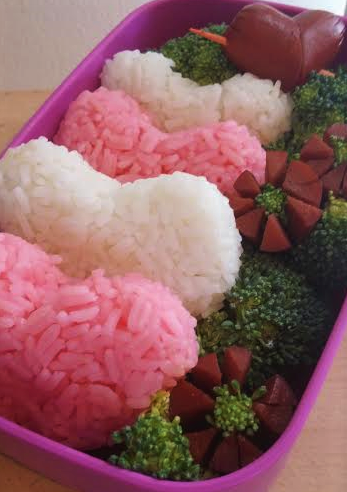 Finally you can tuck the hot dog heart among the veggies. For the finishing touch you can put a little bit of broccoli (have also done this with corn and carrots) into the center of your flower to give it that little extra touch and really make them pop.